It's a late swarm and I was at first optimistic because we've had daily highs in the 20's and there are many wildflowers still in bloom. Now out of nowhere the weather has turned very cold, with a low last night of 5. The forecast for the next week has the overnight lows between 5-10 and the daytime highs only 10-15. We have cold, wet windy weather on the way. I checked on the hive this morning and discovered the 2 small clusters on the ground all perished overnight, as well as any individual Bees that were clung to various places on the outside of the hive. The cluster on the side of the hive leg is doing fine and moving plenty. I didn't inspect the interior but they would have been warm and cozy inside the 1.5" lumber that is their castle. I also observed something I've never seen before. One of the Bees left the cluster on the outside of the hive, then walked up the side of the hive to squirt out 3 streams of liquid. No idea what that was, but it seemed intentional, left a very clear stain in the wood, and then it returned to the cluster. I'm wondering if there is any more I can do to help the survival of this swarm. I don't see any activity to and from the hive, so I assume it's just too cold to go out foraging. It's a sunny day so I'll return to check the rest of the hive when it reaches 15 degrees. Do large clumps of Bees in a swarm die all at once like this or would it have been the elements that killed them? I observed only a few dead Bees inside the hive yesterday which looked like natural old age. The clumps of bees on the ground that appear dead are probably just in torpor and will revitalise if they are warmed up. I would gently scrape/brush the bees on the outside into a container and dump them in the hive with the others. They will not survive on the outside. Also the bees sitting on the bottom of the hive on the thistle will perish as warm air rises and so any heat they generate will be lost into the space above. They need to be hanging from the top bars where the heat they generate will remain. 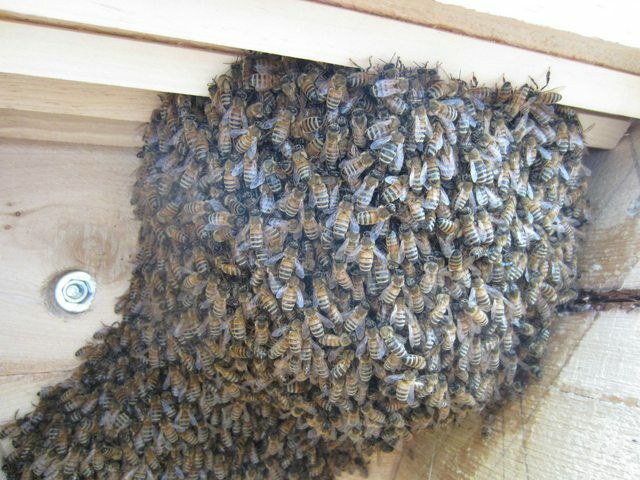 Also, if they are not warm enough to build comb they will not survive, although unfortunately they have very little chance anyway, but if you want to give it a go, make some warm 1:1 sugar:water syrup and feed them from a top feeder. Firstly though, shake them off that thistle because it is not helping them and get as many of the others in the hive as possible. If you drill a hole in one of the top bars. Punch some small holes in a jam jar lid, fill it with warm syrup and put the lid on and place it over the hole in the top bar (invert it first to make sure the syrup doesn't run straight out... if the holes in the lid are small enough, the vacuum will prevent the syrup running out. Trickle a little warm syrup on the bees (don't drown them) and hopefully that will give them the energy to at least climb up to the top bars and perhaps start building. Unfortunately my gut feeling is that this swarm is not queenright, hence the multiple clusters and with it being so very late in the season and the weather changing, there is little hope. Sorry to be negative and I would be delighted if you can prove me wrong.... my bees have before on more than 1 occasion, so don't let me put you off! PS. As Adam says in your other post, plug at least 2 of those entrance holes. Ideally 2 and a half if you can, especially if you are going to feed them as that may attract wasps/robbers. I'll head over shortly and do everything you've suggested! Just a question, when you say not Queenright, what do you mean by that? She means it does not have a queen. When bees have a queen they tend to cluster around her, if there is no queen they have no anchor and some form clusters all over the place. Good luck with this swarm, I think you will need it considering where you are located. Hi again James, If the colony is a prime swarm with a mated queen, they are very cohesive and if any get separated from the main group with the queen or if there is any disturbance of the cluster, the main group fan to tell the others where to come to and they quickly reform into a single cluster again. The lack of fanning by the bees in the hive and the fact that they sat attached to the thistle instead of climbing up to the top of the cavity to hang from the top bars suggests they do not have a mated queen.... or they had got severely chilled. Secondary swarms, sometimes with multiple virgin queens do produce multiple small clumps like this when they gat dispersed. If it is a secondary swarm (or cast as they are often referred to) it is probably too late in the season for the queen to get mated, as most of the drones(male bees) have been evicted from the hives by now. They are definitely looking better now that you have removed the thistle and feeding them is ABSOLUTELY essential if they are to have a chance of survival. To give you an idea of how much feed they will need...... we are talking gallons and gallons of syrup. Initially 1:1 to help them build comb and then 2:1 thick syrup to store in the comb, but first they have to produce baby bees in that comb which will be the ones that over winter. They would need a minimum of 10 kg of stores to over winter (that is probably a gross underestimate) and maybe another 5 kg of sugar in 1:1 syrup to build the comb in the first place. The way they are set up at the moment. I would drill a small entrance hole at the end where they are clustered, block up the other entrance holes and move the follower board closer up to them, so they only have about 5 bars. The more compact they are, the easier it is for them to keep warm and build comb and the less far they have to walk to the syrup and the entrance. You also need to put insulation on top of the bars. I use an old pillowcase stuffed with straw.... but you could use anything.... an old woolly jumper even. Oh and don't keep opening them up. Believe me, I know just how tempting it is and your photos and videos are brilliant, but the odds are stacked against these bees, so they need lots of help and no hindrance. Try to content yourself with topping up the feeder every day and watching the entrance. If the syrup keeps going down and they are flying strongly, then they have a chance. Watch for pollen going in.... that won't happen until they have some comb and a mated queen, so maybe a few days to a week or more. Do keep your eyes open for robbing though as that syrup will attract them. Make sure you don't spill any on or outside the hive and that there are no little gaps anywhere that other bees or wasps can get in. Topping the jars up on an evening will help too. Can't think of anything more at the moment. You've done really well so far. Keeping fingers crossed that, with your help, they can beat the odds. Thank you very much Barbara, really great advice! I'll do those things shortly, and get one last look inside the hive while I move the followers closer. Last night I moved the hive away from the cedar tree from which they swarmed from. The other half of the colony is very active so I thought it might be good to move them away. I'm wondering now would it increase my chances for them to be close together? In the situation that I have a Queen that needs mating, would drones from the remainder of the tree colony help? I could move it back this evening if you think this could help. Otherwise I'll drill the new hole and pack them tight, and plenty of hay around to add in the insulation. It's a cold windy rainy day again, so I expect all will be quiet at the hives. Well all the Bees are tucked away from the cold. I added a big pillow full of straw on top of the bars, and drilled a new entrance on the end. I moved the follower up and gave them 4 bars width to build in. The other 3 holes are behind the follower, and I added a second follower to contain the feeder. I didn't know what fanning looked like being the newbee that I am, so I checked a few videos. I did see a number of them fanning over the last few days when I was moving them in to the hive, hope that's a good sign! Hope this helps keep them warm, we have a frost warning tonight. Weather looks to improve though, mid 20's next week for about 2 more weeks! Anything else I can do to help them? The floor board isn't a perfect fit and has small cracks (about 1-3mm). Is there anything Bee friendly I can use to seal cracks that will dry quickly? Maybe some mud? There was some activity to and from the hive during the warmest hours today. I melted some beeswax and applied it to the cracks and spaces in the hive construction, so hopefully that will help their cause as well! That cluster is looking a lot better now, Well done with the renovations. Are they taking the syrup? If not, it is because they haven't found it. If necessary dribble a little through the hole in the follower to encourage them to find it. I'm a bit concerned about those great big bolt heads which I think may conduct heat away from the colony particularly in the depths of winter. Is there any way to insulate the outside to prevent that. It's a shame that they chose to cluster right up against one end where the bolts are. The cluster being in a corner like that is another indication that it may be a cast swarm rather than a prime. Hopefully they will have started building comb in the centre of that cluster now. It's good to hear that you have warmer weather coming. They need as much good weather as they can get.... time and seasons are against them so you really need a mild autumn to help them make it. Thanks Barb, I'm really motivated to do everything in my power to help them. I'll melt some more wax and put huge gobs on the outside ends of those bolts. They are sunken on both ends so it won't be hard to seal them up. I'm going to pick up some of those pink insulation panels at the hardware store and stick them on all the walls, the base and on top of the bars in the next few days to give them 100% insulation from the cold air. I was fortunate enough to have a beekeeper come see my hive, same fellow that loaned the gloves and hat for me to wear. He offered to check things out and I explained to him that we're still up in the air as to if we have a queen or not. We inspected the bars the bees were clinging to, and we were able to find several drones. There weren't any comb on any of the bars, so we didn't bother to disturb them all in search of a queen. They've definitely found the feeder, and there were loads of bees down around the entrance to the feeding chamber, and lots eating the syrup. My friend suggested I switch to a 2:1 as soon as possible so I will do so tomorrow. He left me with a handful of fresh wax from his hives and also a large chunk of empty wax comb, and suggested I "glue" the comb to a bar to give them something to start with, and to apply a coating of wax to the tips of my top bar comb guides. Will I run in to any disease issues using wax from another hive? He keeps Langstroth hives and I'm not sure if he's all natural or not. I'm going to see his hives today to get some hands on learning, and I'll find out more about what may be in his wax. I also showed him the cedar tree hive and he expects I do have a queen based on how close the swarm settled and how big the tree colony is. But that I don't know until it warms up and they get busy building comb in my TBH. It seems to me that you have opened the hive at least once a day. This last inspection seems like it was the most intrusive of all. Each time you do this the colony temperature drops from 35C to whatever the temperature is outside. The bees can't build comb when they're cold and they consume stores to get back up to temperature before they can begin work again. Think of a real or metaphorical DO NOT DISTURB sign across the top bars. There may or may not be a queen in there, and if there is, she may or may not be mated. But I would stop opening up the hive now and just leave it. Do whatever you want to do from the outside, including feeding. If at some stage you see pollen going in you probably have a mated queen and your bees have a chance of getting through the winter. If they don't make it, you will at least have some fresh comb, a hive, and some pleasantly swarmy bees nearby that will be the basis of an excellent bait hive for next year. You will also have some experience handling bees and know some helpful local beeks. I should have put my foot down and kept it closed today but I let my fellow Beek have a look and you aren't kidding, it was very intrusive. From now on they are being left alone! I'll check feeder tomorrow to make sure it stays full and just let them go. I definitely don't want to do more than is helpful. I realize checking won't make it any more likely they have a queen, and opening them up to the cold only hurts them! This is only my friends second year, and he keeps langstroth hives so his ideas on handling are a bit different than mine. Everything is making really great sense, you've all been really helpful with this first experience! I'll update when I see new activity around the hive! We have all been guilty of poking around when we shouldn't at some time or another and I understand how having another beekeeper look at them in the flesh when the opportunity arose, would be very tempting. It's just that these bees are particularly vulnerable. Your friend is right that normally, you would feed 2:1 syrup at this time of year, but that is for the bees to store it in the comb for winter. At the moment, your bees have no comb and need to build some, which is why I suggested 1:1 syrup. This is ready food that provides instant energy to build comb. Once they have 3-5 combs, then switch to 2:1 syrup so they can store it. I'm relieved to hear they have found the feeder. That will hopefully get them started now. Good idea to coat the bolts ends with wax and then stick insulation on the outside. It's great that you are so keen to help them. It's also good to hear there are some drones in the cluster as their services may be needed. I look forward to reports of lots of syrup consumption, fine weather and then pollen being taken in. Thanks Barbara, as always your input is welcome and appreciated. I understand the feeder ratios now, I hadn't really thought it through when I was considering switching to a 2:1. Makes no sense whatsoever to feed them food to store when they can't store it! I'll let you know how much syrup they've consumed when I check to top up tomorrow. Yesterday afternoon they had not found the feeder and today they were heavy in to it so I'll see roughly how much they've consumed in a 36 to 48 hour period or less. The bees stopped taking syrup roughly a month ago, and I've just returned from a trip to Nova-Scotia to discover Ontario was hit with some winter! Very cold temperatures (-15) and a bit of snow. I topped up the jars of syrup before I left and haven't checked to see if any has been consumed yet. I didn't see any activity yesterday but today I got to observe them removing dead and dying bees! I was a bit shocked when I went over today, there were dead bees scattered everywhere! It actually warmed up to 5C today so I guess that was warm enough for them to do lots of work. I think some of the dead bees were buried and were exposed in the light thaw we had today. I decided yesterday that today would be the day I moved them. 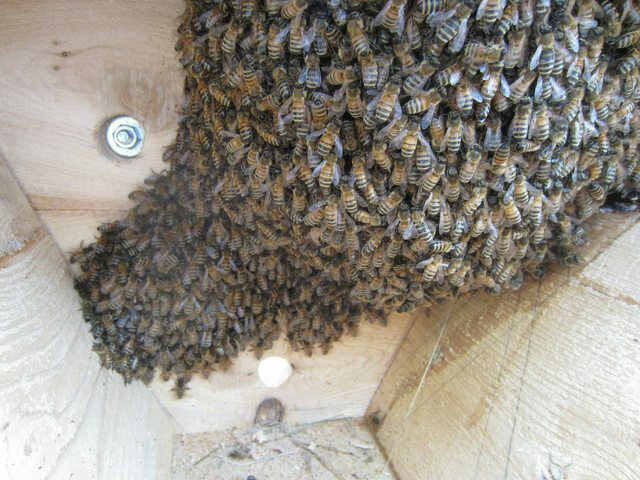 With all the cold I knew they weren't going to be exiting the hive, but I wasn't anticipating the warm weather today. Tomorrow is calling for 10C and the next day 15C! I decided to move them today thinking that with the warmth the added stress of moving them would be a bit negated. I also found out the owners of the farm next door(where the bees were living on a hill top) are fighting again and there was real risk of the hive being destroyed or taken away. So for ill or good they are now moved! I managed to convince my in-laws that they are no threat so I now have easy access to them. I just so happened to have built a nice greenhouse in the spring, and now that it's empty I thought it would make a great cozy winter home. The greenhouse reaches the outside low at night (it's not insulated). I'll need to monitor the daytime highs the greenhouse reaches in the winter. They now are completely shielded from the wind, rain and snow, and have the added benefit of warm sunshine and a bit of greenhouse effect. I was thinking that fondant would be a good thing to add any day now. I'm going to get a solid flat plastic container that has a good seal and make fondant. Then I'll set it on top of the bars, have a drilled entrance in the bottom of the container, and a hole drilled down one of the top bars for bees to access from above. From what I gather, heat from the colony rises and keeps the fondant soft enough to eat, and if I insulate around it it should keep from getting too cold or transferring cold down into the hive. How many bees should I expect to see dead around the hive? If I had an average sized colony by summers end, how many winterized bees will there be for the winter? Is a greenhouse a suitable place to overwinter? I'm a bit concerned that it may mess with them because the daytime highs will be higher. There will be more of a temperature variance between night and day being in the greenhouse. Should I take any additional measures to insulate them? I have straw on top of the bars, and nothing else currently. Any advise on where would be a good place to drill down in to the top bars? I want the entrance to be easy access but also don't want to drill right down in to the comb. Any way I can figure out where the colony is grouped up? I could drill in to the follower board on an angle giving them access that way. I'm assuming the colony will naturally group up to the entrance to the fondant for easy access.